Hey there! Thanks for dropping by The Dance Dome! Take a look around and grab the RSS feed to stay updated. See you around! Rehearsals have begun for the beautiful. So rehearsals have officially begun in Wales with Tanja Raman & John Collingwood providing some great early test footage to the team out here in the States. John (Dbini Industries) has put together a great initial visual sketch of the film so that the American Team can advise on Fulldome shooting logistics. We are not going to spoil the surprise by showing the clip to you but have attached a behind the scenes still showing their dancer Laura going through a move. The piece will feature Laura’s amazing Chinese Pole skills, promising action above the audience as well as around them. 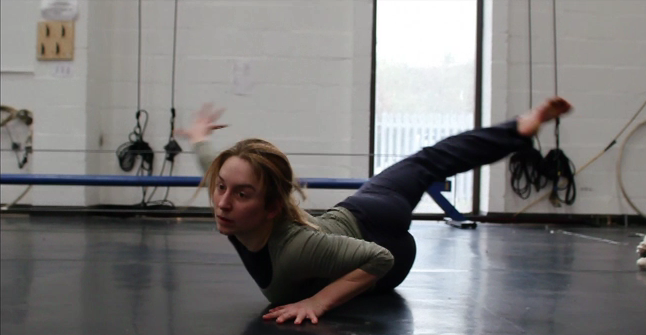 The beautiful is the first of the Submergence Dance Shorts, principle photography will begin in Wales in late march.